If you know a place that you think should be mentioned, please let us know! Southwest-theme restaurant with a good beer selection (lots of bottles) and live music on week-ends. Solid beer selection, but the ubiquitous TVs will bludgeon your soul. 24 beers on tap, no liquor, no sports, no loud music. An excellent music venue with a decent beer selection. New beer bar in the heart of the Smith Street strip. Check the web site for the beer list. One hand pump. A/C to Nostrand, in Bed-Stuy. Another bar, another dreadful web site. A beer shop with bar. Closes at 10 or 11.
btw 2nd & 3rd Ave.
D/N/R to 36th Street open Mon-Thu 11 - 10, Fri-Sat 11 - 11, Sun 11 - 8. One of the grand-daddies of the NY beer scene, reborn on Bleecker Street after the original location turned into a Starbucks. Now with bar food. 3 hand pumps and two dozen taps. Frequent brewery events. A large, traditional beer garden in the Central European tradition. Many German and Czech beers. Two dozen US craft beers, and some 100 whiskeys. Pub food. A light and airy space with barstools and couches; an outdoor garden weather permitting. No real food; snacks on some days, and bagged munchies. 15 taps and 2 hand pumps. 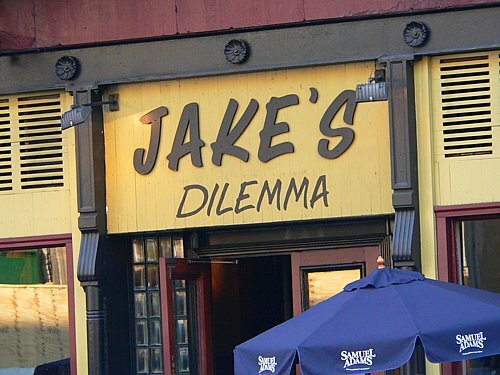 A one-joke bar/restaurant, but as long as it's a good joke, who's complaining? Featuring the beers of Brooklyn, from Coney Island to Williamsburg. 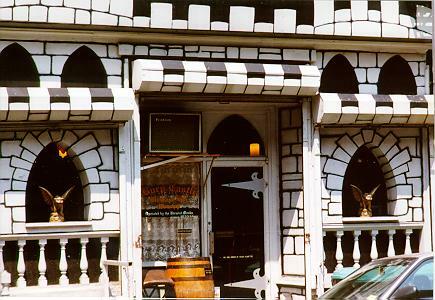 A theme place -- this is a "House of Beer Worship", staffed by "Brewist Monks". Excellent selection of Belgian ales. 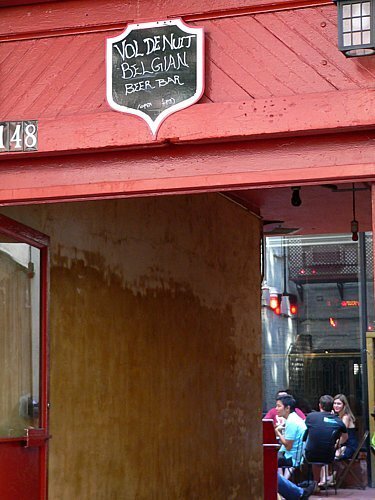 Belgian-themed restaurant and bar with a good beer selection both from Belgium and the US. A tiny, friendly Austrian bistro with a small but pleasant selection of German and Austrian beers, on tap and in bottles. As is to be expected, the food concentrates on the products of the pig. Open 4 - midnight. also a beer store and a covered beer garden and a butcher shop; from the people at Resto, next door. A British chippy with British beer and whiskies, down the block from the Waterfront. Full English breakfast on weekends. Beer hall and restaurant with a selection of 20 draught beers and ciders on rotation, ranging from cask ales to keg-conditioned ales and lagers from the US, Belgium, Germany, Scandinavia and beyond. 1/N/R to Rector St. 4/5 to Wall St.
Gastropub with a strong beer focus. Under new managenent. Excellent taps; several hand pumps; over 60 bottled beers. No food, but you can bring your own. And, yes, brand new toilets! Specializing in less big but no less flavorful session beers. US craft beers on tap, decent international bottle selection. One hand pump. Closed Mondays. btw 13th and 14th St.
One hand pump, 26 taps. 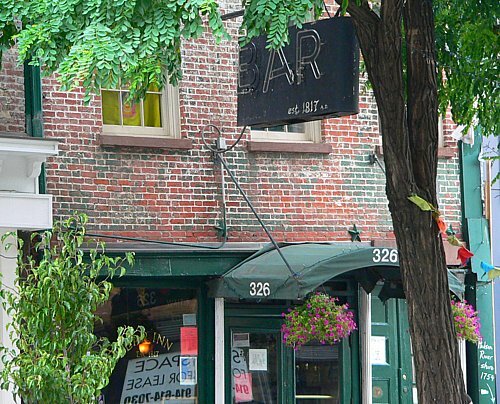 Historic sailor's bar; a designated city landmark, built in 1817. Some decent beers on tap; single malt scotches, brandies. 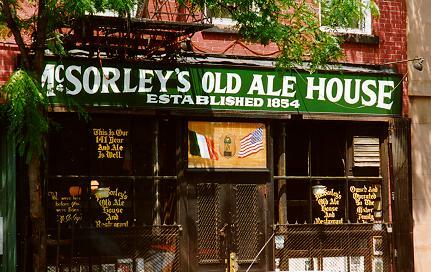 Like McSorley's, go for the history, not the beer. Music late at night on some days. Beer; and cheese; and more. 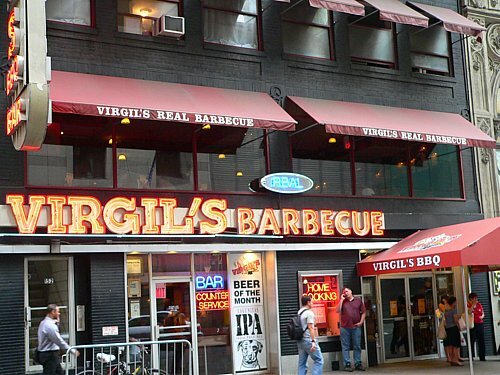 Top-notch barbecue, well-suited beer, and selected Bourbons; from the owners of Spuyten Duyvil, across the street. Open from 5pm. A joint venture from Idle Hands (on Avenue B) and Alewife (in LIC) featuring "Craft Beer, Whiskey, Artisanal Food and Gourmet Coffee". Hefty prices and deplorable giant TVs. 24 taps, a hand pump, a long happy hour, and a back yard. 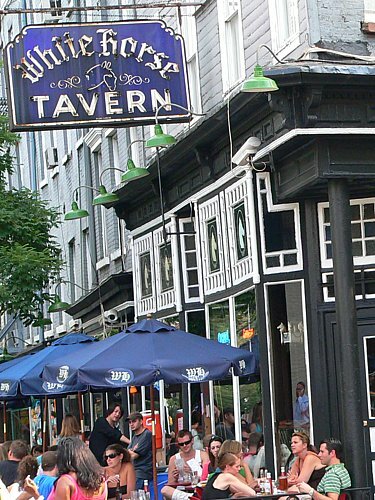 The historic tavern is now operated by Dublin's Porterhouse. 24 taps and weekly gravity casks; weekly beer events, and spacious outdoor seating in season. 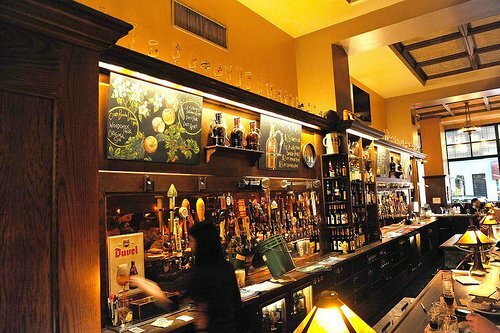 A cousin of four other Ginger Men in Texas (Houston, Dallas, Austin, Ft Worth), The Ginger Man offers 66 taps of fine craft beers from around the world and two hand pumps, with nearly 100 excellent selections of bottled beers. One block from the Pierpont Morgan Library, two blocks from the Empire State Building. From the owners of Mission Dolores, the Owl Farm, and Bar Great Harry. 12 taps and rare bottles. C trains to Franklin. Growlers; snacks and sandwiches. Open daily from noon to midnight (1 am Fri-Sat). More a beer store than a bar, but there are some tables and chairs for instant gratification. Open daily 11am to 10pm except noon to 8pm Sundays. 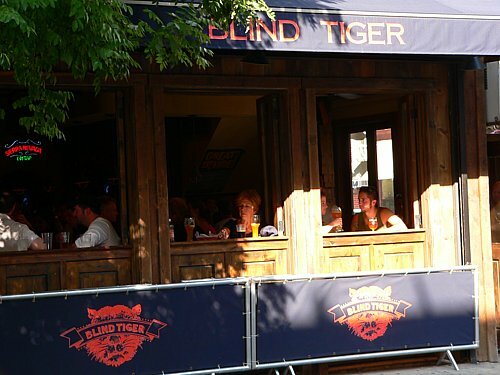 In front of an expensive restaurant that you can't get a reservation at, you will find the "tavern", with its own menu and a good selection of US and foreign beers. Not cheap, but worth the money. 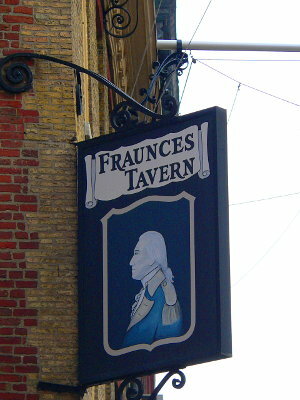 A brick-and-wood restaurant with a separate bar. Two dozen draft lines and a hand pump (the former ranging from $5.50 to $7.50, the latter priced at $6 per half!) and a solid, extensive bottle list of both US and imported beers ($5-$9). No surprises, and the usual cheap stinkers one must overlook, especially considering their touristy location. 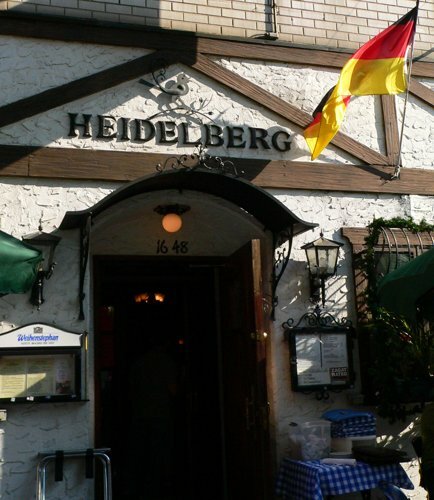 Good selection of fine German beers, great food and an authentic German environment. One hand pump, marred by giant TVs. 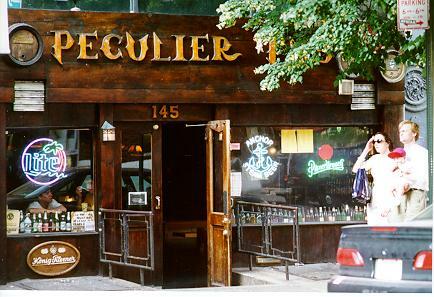 The northernmost outpost in Manhattan, with a broad selection of interesting bottles. Serious beer, pub food, growler refills, and one cask. All that and a beer garden under the 59th Street bridge. 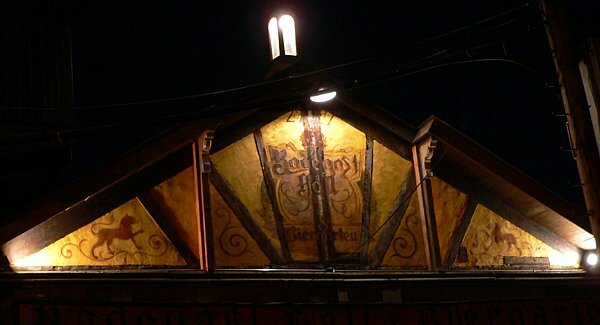 A wonderful old German restaurant with beautiful old bar from the early 1800's, and excellent German food. Also a big outdoor beergarden, with live music some nights.The bar has a fine draft selection, and a huge list of about 115 bottles. The emphasis is on German beers (and with the atmospheric surroundings, what else would you want to drink? ), but the bottled beer list covers the world. In an old-fashioned red-brick building at the corner of 46th and 11th, strategically located a block away from the Intrepid Museum. A mediocre tap list, a bar menu of shellfish and classic pub fare, as well as a regular restaurant. A German wurst restaurant with German beer. Closed Mondays. 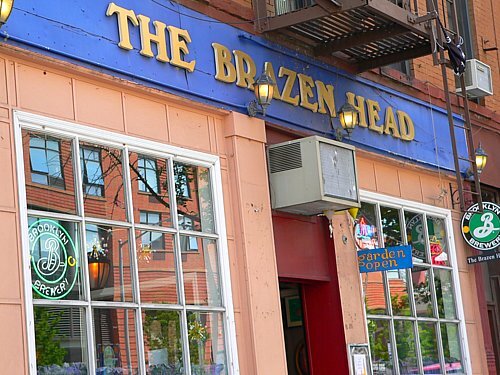 An unpretentious neighborhood bar with good beer. Good beer and pizza. One block from d.b.a. 20 craft beer taps, one cask. 12 taps, including "The best pint of Guinness in New York" (Garrett Oliver). 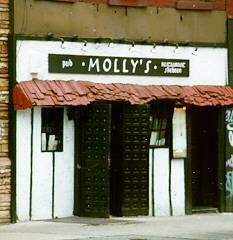 New York's oldest continuously operating bar, opened by John McSorley in 1854. If you absolutely must go, go for the atmosphere, not for the beer. Beer selection is mostly American, with a few imports. 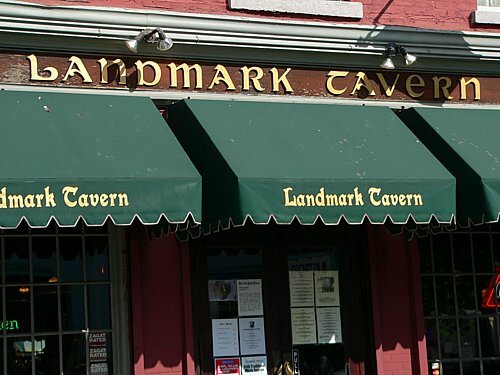 A wonderful, cozy, dark Irish pub with sawdust on the floor, excellent Guinness on tap and fantastic hamburgers. Twenty-plus draft lines of IPA, IPA, or IPA, and two hand pumps, plus a large & impressive selection of bottled beers. Hosts the monthly meetings of The Malted Barley Appreciation Society. German restaurant and beer garden. A beautiful room with wood paneling and Art-Deco fittings, and an improving tap list. Standard burger and sandwich menu. 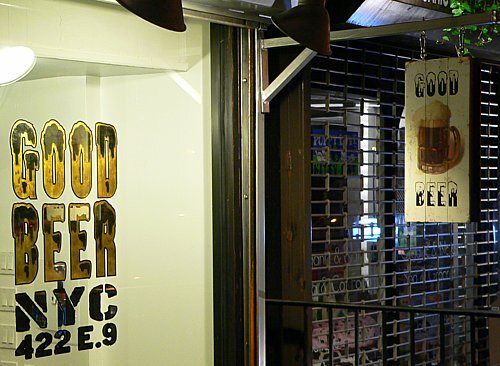 A craft-beer bar and shop in Greenpoint, near the BQE. Growler refills. 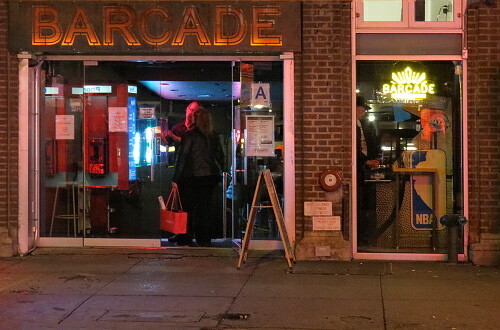 A new sister establishment of Bar Great Harry and Mission Dolores, with 30 lines --two of which are hand drawn casks-- and a mix of US and imported beers with all the right credentials. No food; bring your own. "Mobbed on week-ends" doesn't even begin to cover how wretched this NYU frat-boy place is, despite their excellent selection. A chain of Belgian-style cafe-restaurants with several locations. A dozen decidedly upper-class taps, marred by plutocratic prices and infra dig pours. aka 124 Old Rabbit Club aka 124 Rabbit Club aka Old Rabbit Club... Tiny basement under #124. European bottled beers, no taps. Not an enormous selection, but on MacDougal it's hard to complain! Bar food. Beer (and food) with a German emphasis, but with a good sprinkling of Belgians and others. 14 draft beers, plus select European wines, liquors, and a host of German dishes. 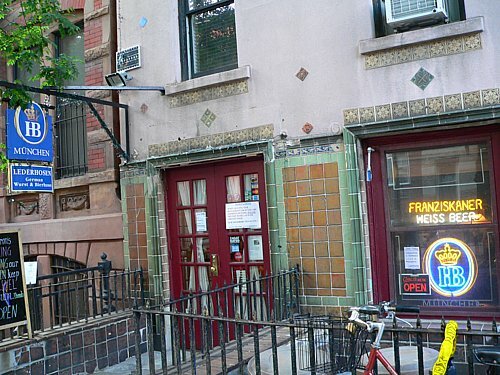 A moderately-priced restaurant, just steps from the Flatiron, with a good beer selection. British gastropub with two hand pumps and a few interesting bottles. Kitchen open until 2am. For those days when beer calls for breakfast, one of the few bars left in the city to start serving at 8am. "The best beer bar in the city" -- the BBC. Five excellent taps, one hand pump, a wealth of well-chosen bottles, and snacks. 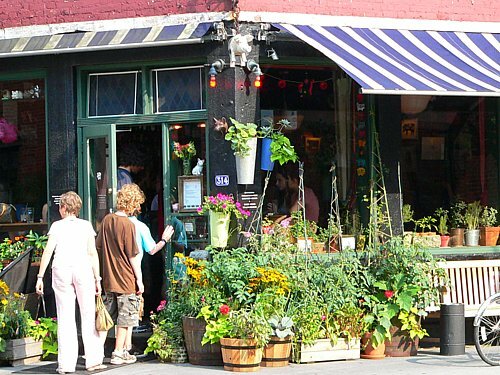 For more substantial dining, Fette Sau is across the street. Beer garden with a complete dedication to German beers and food. Two hand pumps. Bottled UK beers. Excellent selection, but so overpriced as to be contemptuous. 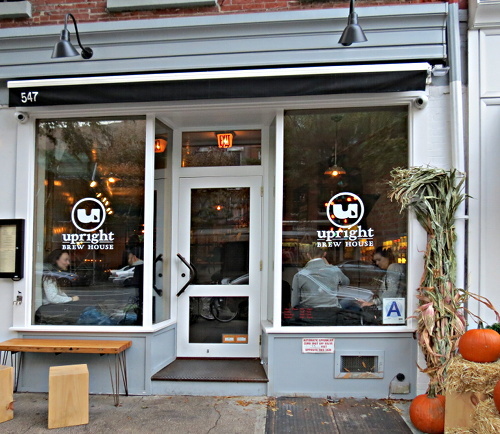 A pleasant beer bar and coffee shop in Greenwich Village, specializing in US craft beers on tap (12 lines, growlers available) and in bottles (about 50). Several ciders and perries. Bar food including several sandwiches. Blessedly TV-free. Small backyard. Good beer menu, with two dozen draft lines and numerous bottles listed in a printed menu. Uncluttered Scandinavian, wood-paneled design; the ominously looming giant TV screens can be safely ignored by sitting strategically. Prices are on the expensive side, even for Manhattan. Good barbecue and bottled beers. Don't bother with the taps. Excellent and frequently-changing selection of microbrews and top-quality imports on tap, including a selection of locally-brewed beers. Pub food. 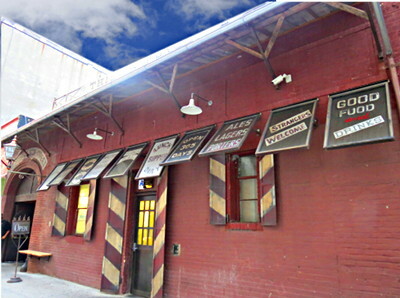 Beer garden and music venue located in the former Hittleman brewery on Brooklyn's Brewer's Row, with almost 70 (mostly worthy) taps. L to Montrose Ave.
Memories of Dylan Thomas. A large, old-fashioned pub notable more for its ambiance than its beer. A Bavarian-style bar with long communal tables. Simple German food is available.